Deployed by Germany a week after the Normandy invasion, the first V-weapon, also known as the "V-1" or "buzz bomb," was designed solely as an instrument of terror and had negligible military value. "V" stood for "Vengeance." Firing off buzz bombs was Hitler's way of punishing the Europeans who had resisted him for five years, especially the British and Belgians. Wildly inaccurate, buzz bombs were intended to kill and intimidate as many civilians as possible. V-weapons were responsible for many thousands of deaths in Europe. London and the vital port city of Antwerp, Belgium were particularly hard-hit. The buzz bomb was the world's first pilotless jet aircraft. My dad used to say that they sounded like the "putt-putt" of a slow motorboat, but buzz bombs flew at 400 mph, roughly equal to the speed of the fastest Allied fighters of the day. By early 1945, the British had become expert at shooting them down and diverting them from civilian populations. National Archives, College Park, Maryland. By contrast, the Allies had no defense against the second V-weapon, a rocket called the "V-2." The world's first ballistic missile, the 47-foot V-2 flew at a height of 50 to 56 miles and a speed of 3,800 mph, too high and too fast for any known countermeasures. 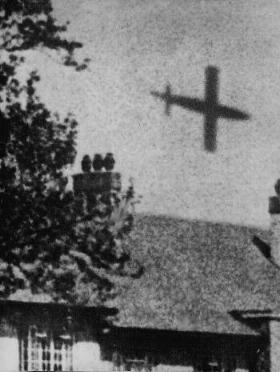 While civilians could see and take cover from a falling V-1, they had no such luxury with the V-2. Anyone within the approximately 75-foot "kill radius" of an exploding V-2 would die without warning. You can read more about the V-weapons in Dear Mom, Dad & Ethel: World War II through the Eyes of a Radio Man.